Before :- Rakesh Kumar Garg, J. For the Petitioners :- Mr. Anshuman Dalal, Advocate. For the Complainant :- Mr. P.S. Sullar, Advocate. For the State :- Mr. D.S. Mann, AAG Punjab. Indian Penal Code, Sections 498-A and 406 - F.I.R. under Section 498A , 406 I.P.C against husband and in laws - Compromise effected - Petition for divorce under Section 13B H.M.A also accepted. - F.I.R quashed on basis of compromise. 2007 (3) RCR (Criminal) 1052, Relied. Kulwinder Singh v. State of Punjab, 2007(3) RCR (Criminal) 1052. Rakesh Kumar Garg, J. - Respondent No. 2 got registered FIR No. 200 dated 26.7.2009 under sections 498-A, 406, 506, 323, 120-B IPC registered at Police Station City Ambala, against the petitioners. 2. The instant petition has been filed for quashing of the aforesaid FIR on the basis of a compromise. "Learned counsel for the petitioners states that matrimonial dispute has been settled amicably by the parties. Therefore, present criminal proceedings may he quashed pursuant to the compromise. Notice of motion for 29.02.2012." Let the parties appear before the trial Court on 3.3.2012 and gee their statements recorded in support of the compromise, as alleged. The trial Court is directed to send a report with regard to the fact as to whether the statements have been made by the parties voluntarily and without any pressure, before the next date of hearing. Copy of this order be given dasti on the payment of usual charges". "1. That a FIR No. 220 dated 26.07.2009 under Sections 498-A, 406, 506,323,120-B of IPC registered at Police Station City Ambala, district Ambala on the statement of the deponent against the petitioners in the above mentioned case. That the contents of the above mentioned CRM-M-33498 of 2011 are admitted to the extent that now with the intervention of the respectable and common relatives, the deponent and the petitioners have arrived on a compromise dated 14.7.2011 (Annexure P2). 3. That in view of the compromise dated 14.7.2011 (Annexure P2) the deponent/complainant does not want to pursue with the case and have no objection if the above mentioned FIR is quashed." 28. The compromise, in a modern society, is the sine qua non of harmony and orderly behaviour. It is the soul of justice and if the power under Section 482 of the Cr.PC. is used to enhance such a compromise which, in turn, enhances the social amity and reduces friction, then it truly is "anesh hour of justice". 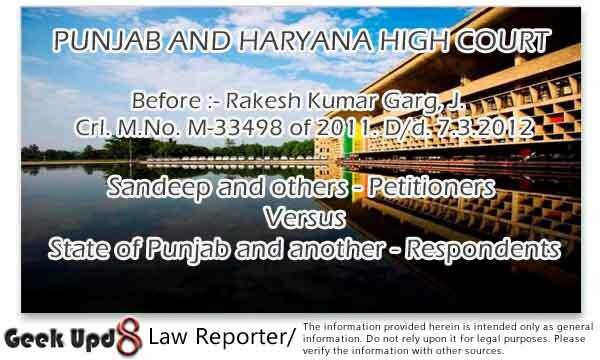 Disputes which have their genesis in a matrimonial discord, landlord-tenant matters, commercial transactions and other such matters can safely be dealt with by the Court by exercising its power under Section 482 of the Cr.P.C. in the event of a compromise, but this is not to say that the power is limited to such cases. There can never be any such rigid rule to prescribe the exercise of such power, especially in the absence of any premonitions to forecast and predict eventualities which the cause of justice may throw up during the course of a litigation. 29. The only inevitable conclusion from the above discussion is that there is no statutory bar under the Cr.P.C., which can affect the inherent power of this Court tinder Section 482. Further, the same cannot be limited to matrimonial cases alone and the Court has the wide power to quash the proceedings even in non-compoundable offences notwithstanding the bar under Section 320 of the Cr.P.C., in order to prevent the abuse of law and to secure the ends of justice." 30. The power under Section 482 of the Cr.P.C. is to be exercised Ex-Debitia Justitia to prevent an abuse of process of Court. There can neither be an exhaustive list nor the defined para-meters to enable a High Court to invoke or exercise its inherent powers. It will always depend upon the facts and circumstances of each case. The power under Section 482 of the Cr.P.C. has no limits. However, the High Court will exercise it sparingly and with utmost care and caution. The exercise of power has to be with circumspection and restraint. The Court is a vital and an extra-ordinary effective instrument t9 maintain and control social order. The Courts play role of paramount importance in achieving peace, harmony and ever-lasting congeniality in society. Resolution of a dispute by way of a compromise between two warring groups, therefore. should attract the immediate and prompt attention of a Court which should endeavour to give full effect to the same unless such compromise is adborrent to lawful. composition of the society of would promote savagery." 6. Thus, keeping in view the facts and circumstances of case and the law laid down by this Court in Kulwinder Singh's case (supra), the FIR in question and subsequent proceedings arising therefrom are quashed against the petitioners.